Parma ham Italian dry cured ham made from whole pork leg; salami Milano seasoned pork salami; coppa ham dry cured pork flavoured with spices; Salami with fennel cured pork salami with fennel seeds. 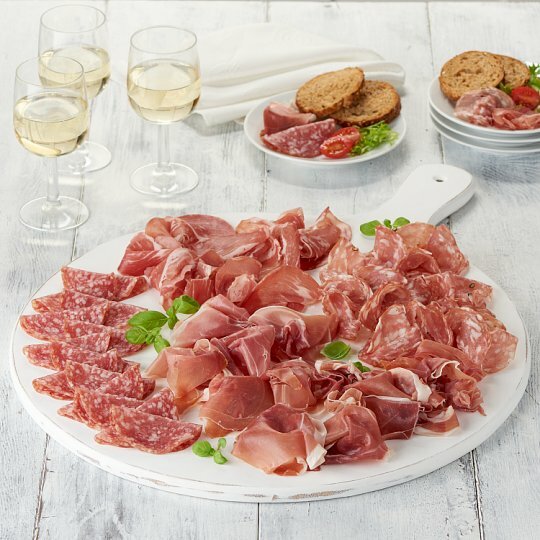 This classic Italian antipasti selection consist of delicate slices of 14 month minimum matured Parma ham; mild, medium cut salami Milano dry cured with garlic; aromatic Coppa and salami with wild fennel seeds. All made with selected cuts of Italian pork. Parma ham [Pork Leg, Sea Salt], Coppa [Pork, Salt, Dextrose, Antioxidant (Sodium Ascorbate), Spices, Preservatives (Potassium Nitrate, Sodium Nitrite), Dried Garlic], Salami Milano [Pork, Salt, Dextrose, White Pepper, Antioxidant (Sodium Ascorbate), Preservatives (Sodium Nitrite, Potassium Nitrate), Dried Garlic], Salami with Fennel [Pork, Salt, Dextrose, Fennel Seed, Fennel, White Pepper, Antioxidant (Sodium Ascorbate), Black Pepper, Preservatives (Sodium Nitrite, Potassium Nitrate), Dried Garlic]. Parma ham Prepared from 140g of Pork per 100g of Parma ham, Coppa Prepared from 160g of Pork per 100g of Coppa, Salami Milano Prepared from 146g of Pork per 100g of Salami Milano, Salami with Fennel Prepared from 142g of Pork per 100g of Salami with Fennel. Keep refrigerated. Once opened consume within 2 days and within 'use by' date shown. Cured pork salami with fennel seeds. INGREDIENTS: Pork, Salt, Dextrose, Fennel Seed, Starter Culture, Fennel, White Pepper, Antioxidant (Sodium Ascorbate), Black Pepper, Preservatives (Sodium Nitrite, Potassium Nitrate), Dried Garlic. INGREDIENTS: Pork, Salt, Dextrose, Antioxidant (Sodium Ascorbate), Spices, Preservatives (Potassium Nitrate, Sodium Nitrite), Dried Garlic. INGREDIENTS: Pork, Salt, Dextrose, White Pepper, Antioxidant (Sodium Ascorbate), Sodicsal (50% Salt, 50% Sodium Nitrite)(Salt, Preservatives (Sodium Nitrite)), Dried Garlic, Starter Culture, Preservatives (Potassium Nitrate). Prepared with 140g of raw pork per 100g of finished product.